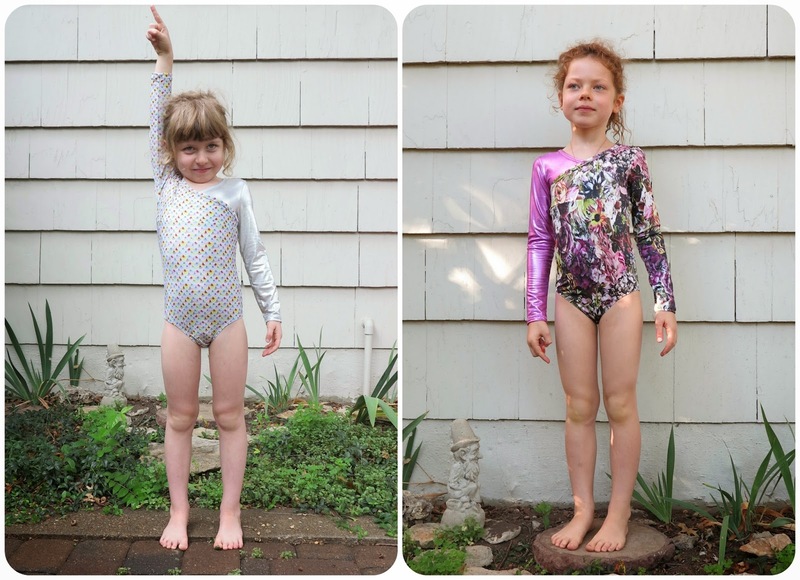 These leotards are such a quick and easy make. I love the opportunity to use contrast fabric, and I’m very happy with the overall fit on my tall, slim girls. I’ve made a few pairs already (here and here) so I knew what to expect. For Miss Seven, I stuck with a size 6, the same as last time. They fit her very well through the torso. The leg elastic is borderline too tight, but I think she’ll be ok with it. That’s the only thing I’d say about this pattern, is check the fit of the leg elastic before sewing it on. Miss Three LOVES gymnastics, more than anything else in this world right now. 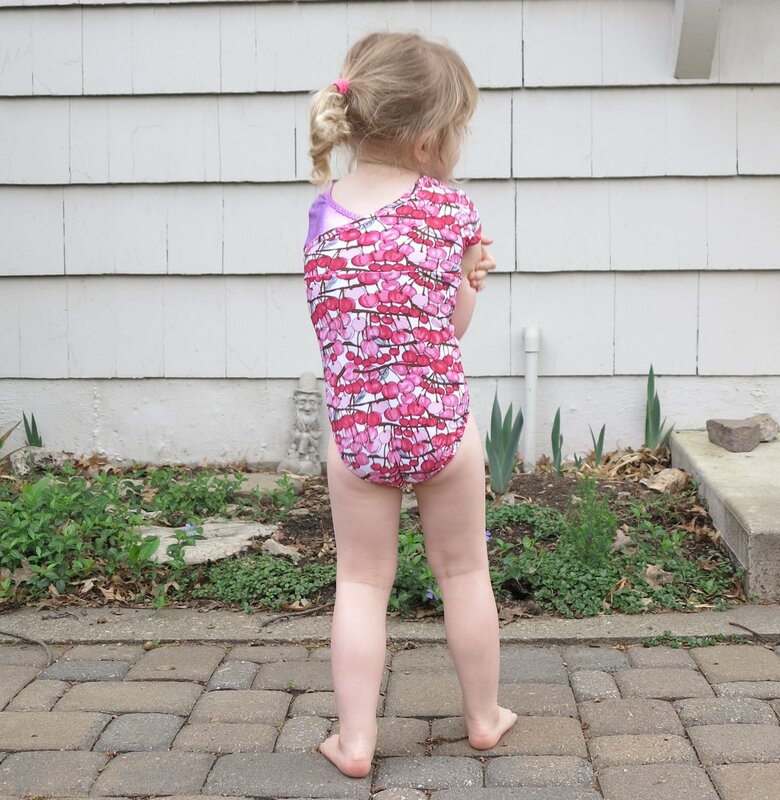 Three year olds really don’t need gymnastics leotards but I couldn’t resist making her one, just so I could watch her impossible cuteness in it. She wakes up everyday, puts on her leotard, and asks if its her ‘nastics day. Her suit was made up in a size 3 and it’s a perfect fit all over. She is on the 50th centile from head to toe, the true “baby” of this family. 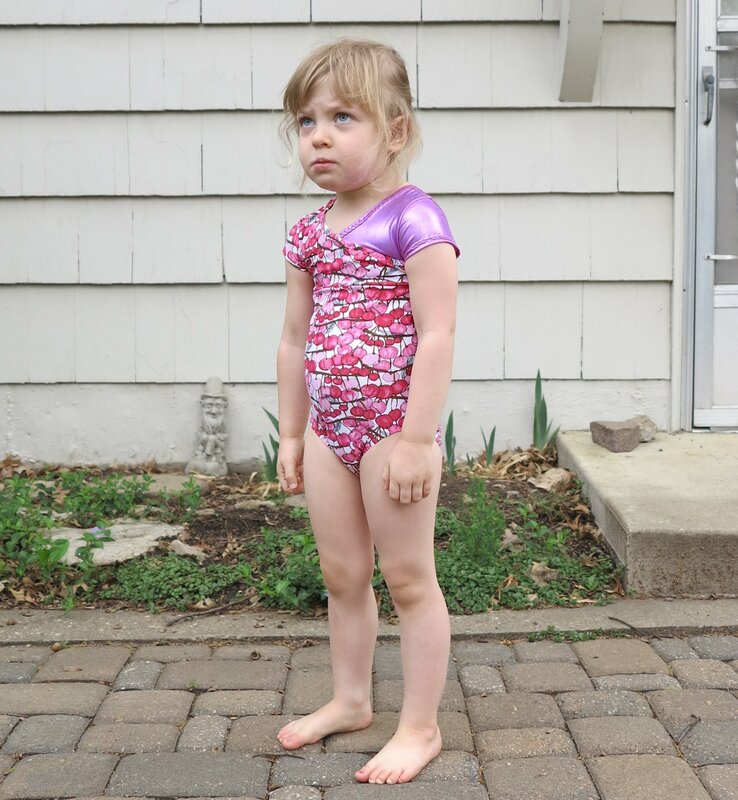 Despite, LOVING this suit, and actually being a very happy child all day, she decided to practice her grumpy, angry person poses for the photos. I did my best, but there really isn’t any point negotiating with a three year old. 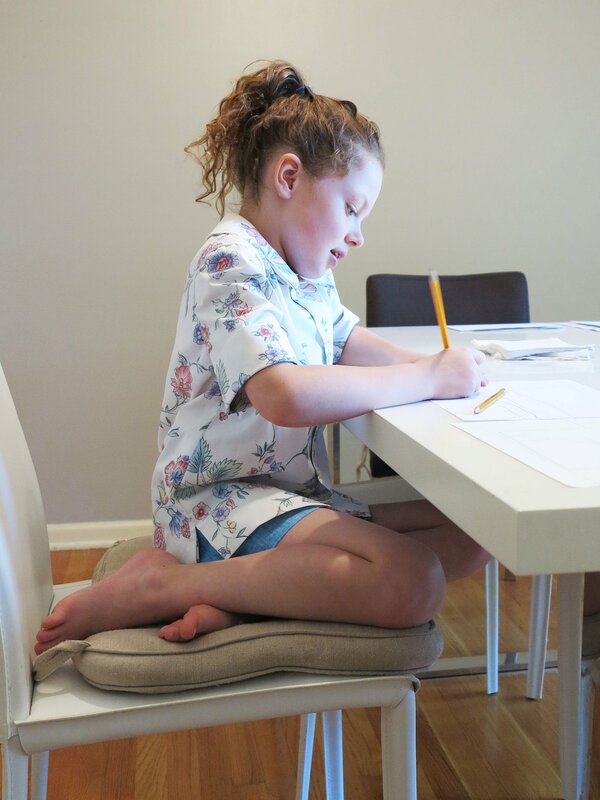 This entry was posted in Jalie 3136, leotard, lycra, Mood, spandex, swimsuit, swimwear, Tessuti Fabrics and tagged girls, Jalie 3136, leotard, lycra, spandex, swimsuit, swimwear, Tessuti Fabrics on April 20, 2015 by Debbie Iles. I’m quite fond of Jalie patterns for active wear. 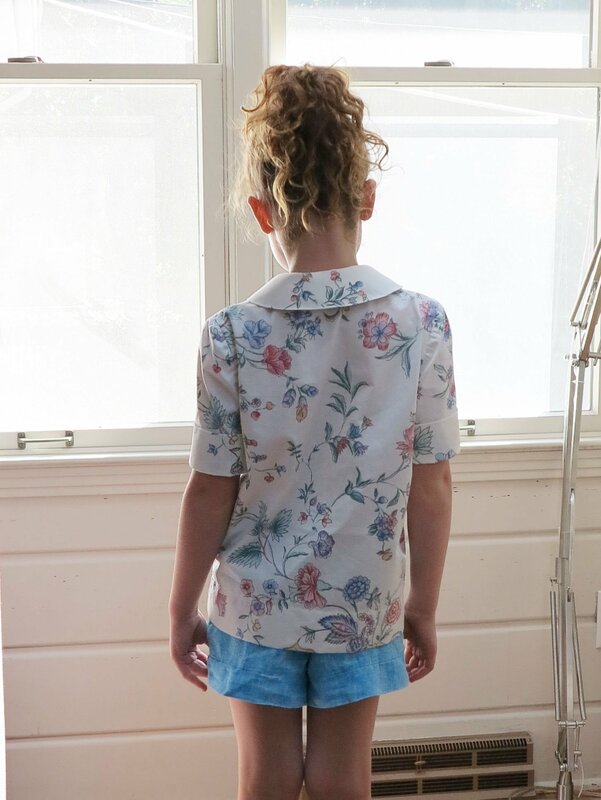 I’ve only ever sewn the smaller child sizes, but I generally find the fit to be very good on my girls. 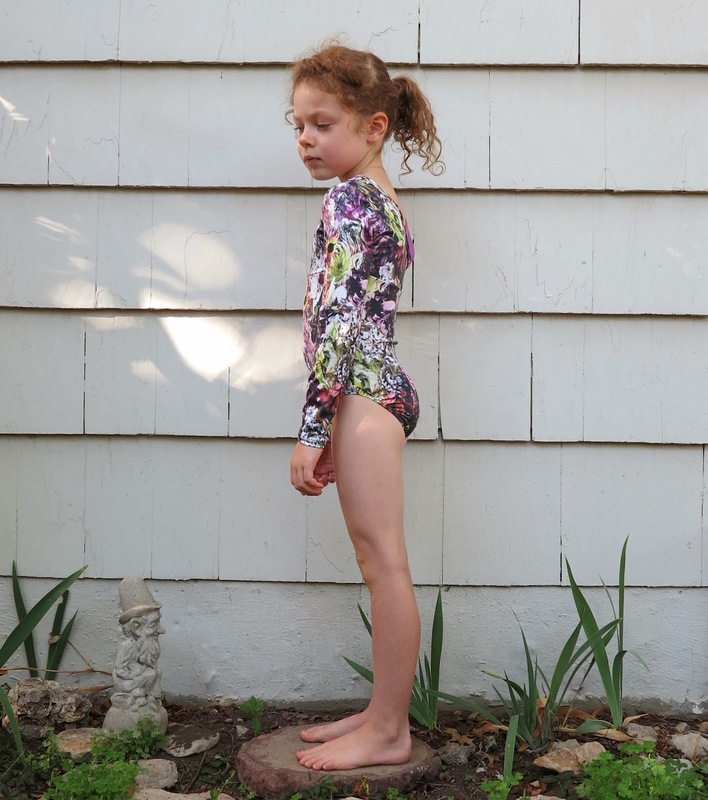 I made this leotard up in a size 7 (years) for my nearly-Miss Seven. However, because it is destined to be a birthday gift, Miss Five agreed to model it for the photos. 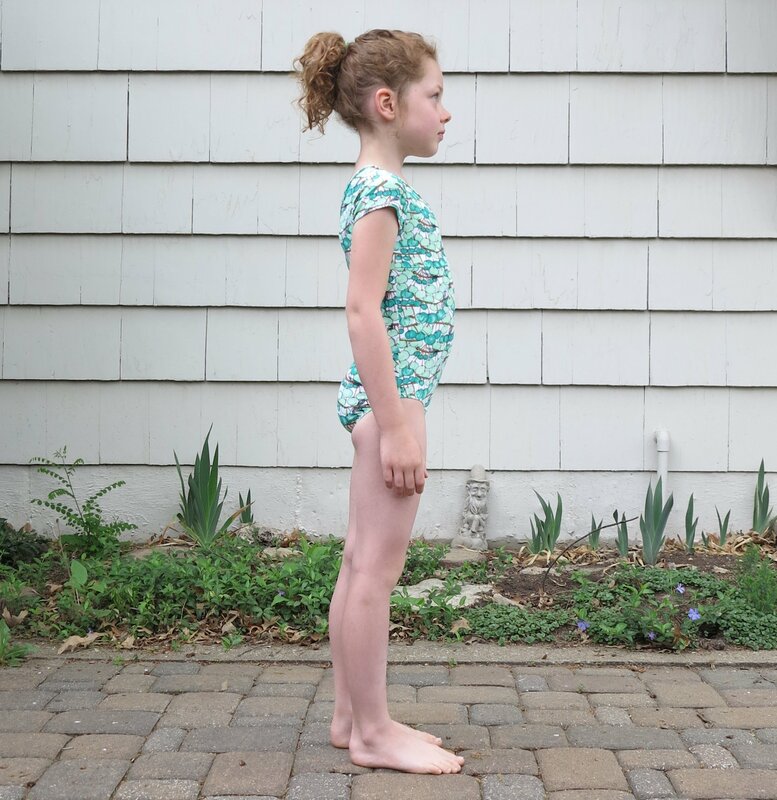 The length of this leotard is a little long for my five year old (as would be expected), but not by much. The width fits nicely and the leg elastic is a little on the snug side, but not overly so. Miss Five disagrees. 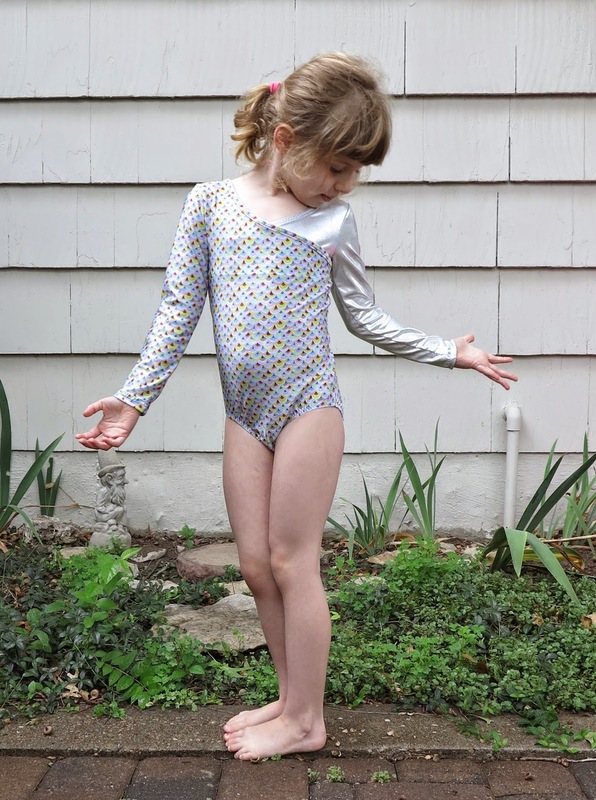 She’s actually stopped wearing her last pair of Size 5 leotards in this pattern specifically because of the tight leg elastic. Initially, I wasn’t sure if the tight leg elastic was just a mistake on my part with the first pair, but now I realise it is a feature of the pattern, and so probably worth considering if you are planning to sew these. As a reference point, Miss Five is tall, but apart from her height, she’s on the 50th centile for BMI and a perfectly standard size 5 on all her other body measurements (which has been very useful for me in my recent patternmaking!). This entry was posted in Jalie 3136, leotard, lycra, spandex, Tessuti Fabrics on March 14, 2015 by Debbie Iles. There is something to be said about quality fabric. I made two little gym leotards not too long ago. They are already in a very sorry state. I probably should have been handwashing them, but I’ll freely admit that I’m not a handwashing type of person. I spent the entire duration of my teenage years training 5hrs a day in heavily chlorinated swimming pools, so I think I have a discerning eye for good swimsuit lycra. Bathers never used to last long in my swimmer’s world. The elastic deteriorated within the fabric itself, the colours faded and the swimmers stretched out, turning see-through, until I had to wear two pairs together. It isn’t just chlorine that kills the fabric. UV light and sweat also contribute. I’ve been so impressed with the swimsuit fabric I’ve purchased from both Tessuti Fabrics and the Fabric Store in Sydney. I’ve made several pairs of small people bathers (here, here and here) in the last few years. The oldest pair is faded and a little abraded on the bottom, but there is still no sign of the fabric deteriorating. 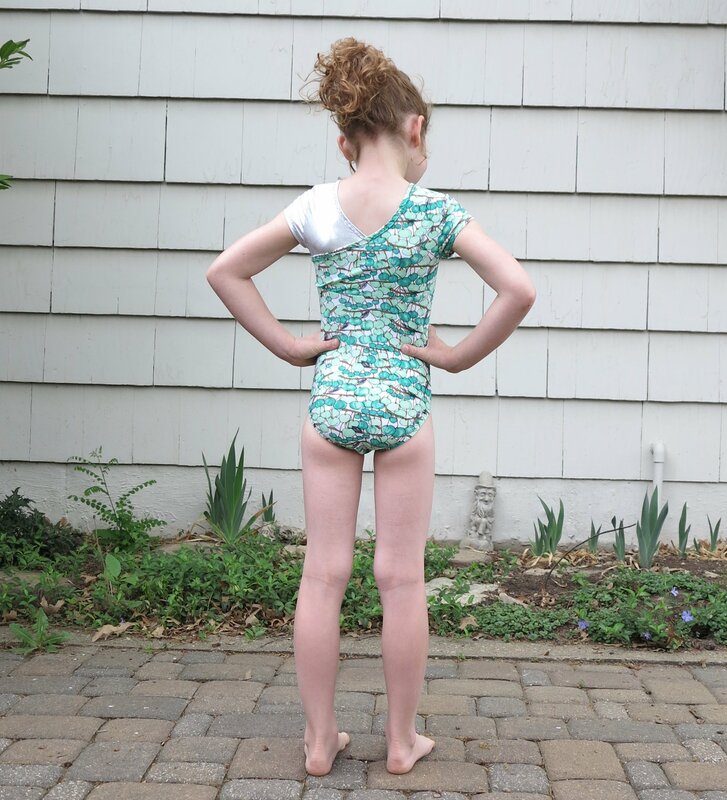 The same can’t be said for the metallic spandex I used for my big girls’ gym leotards (here and here). They’ve only been worn for a few months and the metallic coating has nearly all been washed off, somewhat unevenly. The actual fabric has also stretched out and lost a bit of it’s recovery in places. But those side panels of swimsuit lycra are still in perfect condition. I wonder if metallic coated fabrics are a just a little less hardy than what I’m used to. This time round, I made the main body of both leotards up in swimsuit fabric and just used the metallic spandex for contrast on one arm. What can I say? I don’t like to throw away stash and my girls like shiny things. If one arm loses a bit of it’s sparkle, it won’t affect the rest of the suit. The pattern I used was Jalie 3136. 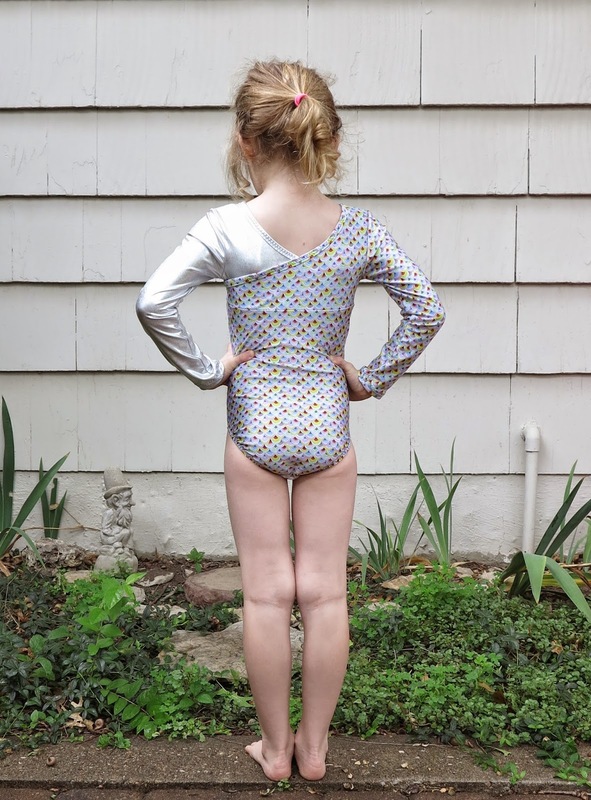 Miss Four’s suit was made up in rainbow fish scale mermaid lycra (new stock from Tessuti), cut to a size 5. I added 1.5cm to the torso length for her because she is a very long mermaid and I wasn’t quite sure about Jalie’s length sizing. As it turned out, I probably could have skipped this modification. I’m going to call these leotards a win. Miss Four loves them and I can’t help but smile when I see those fabulous rainbow fish scales. The great thing about sewing little leotards is that they use up such a tiny amount of fabric. I still have enough leftover for Mummy gear next summer. Miss Six’s leotards turned out just as well. I made absolutely no modifications to her version. Aren’t those flowers just the prettiest? Gnome thinks so. This entry was posted in Jalie 3136, leotard, lycra, Mood, spandex, swimwear, Tessuti Fabrics, The Fabric Store on September 25, 2014 by Debbie Iles.